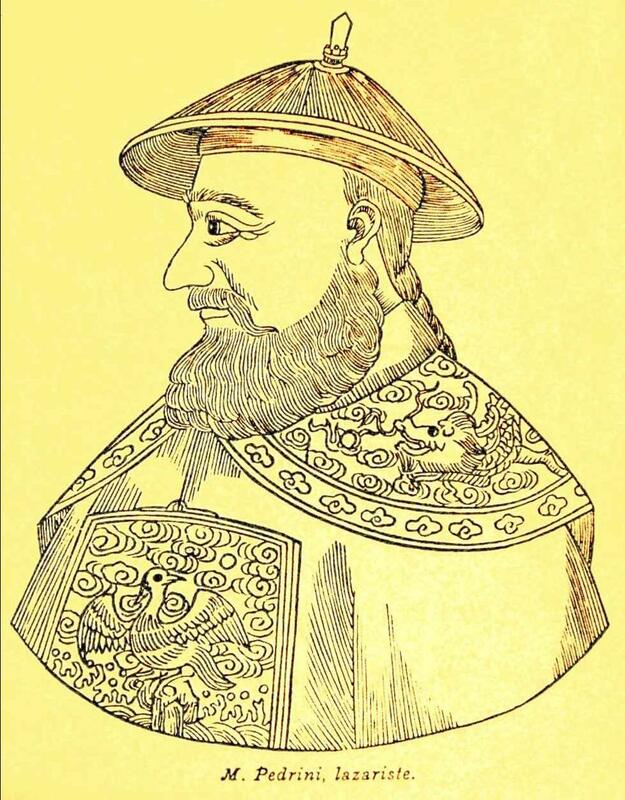 As we noted in the introduction to The Christian Conundrum of Yongzheng (China Heritage, 13 April 2018), negotiations between the Vatican and Beijing on the future of the Catholic church in the People’s Republic of China have drawn attention to the contemporary echoes of late-dynastic religious policy. Eugenio Menegon is a specialist in the history of the Chinese church and, among other topics, he has also studied the fate of Christian missionaries at the court of the Qing emperor Shizong 世宗 (Aisin Gioro Injen), generally known by his reign title Yongzheng (雍正 hūwaliyasun tob, r.1722-1735). In the second part of ‘Yongzheng’s Conundrum. The Emperor on Christianity, Religions, and Heterodoxy’, Menegon introduces and analyses the audiences that Yongzheng granted to Christian missionaries. Held over a number of years, the audiences allowed the emperor to question for himself the Court missionaries who served the Qing imperial enterprise while attempting to extend the influence of their various Catholic denominations. It also gave the new ruler an opportunity to elucidate openly the thinking behind his policies towards Christianity. The audiences were held both at the imperial palace and at Yuanming Yuan 圓明園, the garden-palace to the north-east of the walled city of Beijing where Shizong / Yongzheng actually lived and worked. Eugenio Menegon’s study of the imperial mindset three hundred years ago provides unexpected insights into the calculations of the self-appointed moralisers who rule in Beijing today. It also offers a different context to the tireless debate about ‘Chinese ways and Western knowhow’ 體用. On 1 July 1724, in the midst of an unprecedented empire-wide anti-Christian campaign, Catholic missionaries at the Qing court in Beijing secured their first audience with the new ruler, Shizong 世宗, who took the reign title Yongzheng 雍正. What transpired during that meeting reveals the motivations and reasoning of Yongzheng in implementing his religious policies, including the prohibition of Christianity. It is nearly two hundred years since Matteo Riccci travelled here to the east by sea. We your subjects are grateful that your Sacred Dynasty has treated us leniently and not as outsiders, so that we consider China to be our home. We respect the laws and pursue cultivation, our principles are not heterodox. 竊臣等自利瑪竇航海東來，歷今幾二百年，幸荷聖朝優容無外，故士至如歸。守法焚修，原非左道. After ascending the throne, all my policies have respected precedents 憲章舊典 established by [Our father] Emperor Shengzu to encourage that which benefits the empire and eliminating evils 與天下興利除弊. In regard to Our Command that you be removed to Macao, this is due to the fact that some Westerners resident in Fujian have stirred up trouble there. It is a measure We have taken in response to the requests of high-ranking officials in charge of borderlands, as well as to memorials submitted here at court. Policy is a matter of public concern 政者公事也. How could I discard the opinion of the state 國家之輿論and show private favor and mercy 私恩惠 to you [missionaries]? You now earnestly beseech indulgence; We can but issue an edict to the Governor of Guangdong to suspend temporarily [the previous order]. We instruct local high officials to deliberate the matter prior to a further determination. 朕自即位以來，諸政悉遵聖祖皇帝憲章舊典，與天下興利除弊。今令爾等往住澳門一事皆由福建省住居西洋人在地方生事惑衆，朕因封疆大臣之請、庭議之奏施行。政者公事也。朕豈可以私恩惠爾等以廢國家之輿論乎。今爾等既哀懇乞求，朕亦只可諭廣東督撫暫不催逼，令地方大吏確議再定. 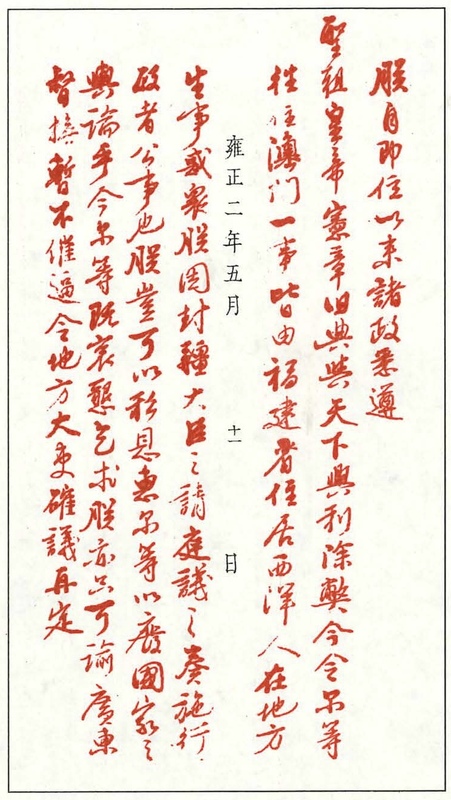 Yongzheng’s vermilion endorsement on the memorial by Ignaz Kögler S.J., 1 July 1724 (YZ 2.5.11), reproduced in QTS, vol.1, doc.43, p.59. At first the emperor appeared to affirm his legitimacy as dutiful son and monarch, and implicitly endorse the policies of his father. In fact, he was hinting that it was inappropriate for the missionaries to raise imperial precedents: in his view, his father’s private imperial patronage of the missionaries did not reflect the interests of the state, nor did it amount to a coherent religious policy. By using the Confucian dyad ‘public/private’ 公 / 私 to justify himself, Yongzheng stated that public opinion and interest won out over ‘private favor and mercy’, while also ‘blaming’ his officials for the expulsion of the missionaries. How could he go against the opinion of his bureaucrats? Yongzheng was, of course, being disingenuous. He could do as he wished! Instead he employed the rhetoric of the dutiful Confucian monarch to exonerate himself from any possible charge that he was lacking in filial piety, or indulging in political partiality and arbitrariness. At the same time, he skillfully depicted himself as being less hawkish than his officials. You say that your law is not a false law 非左道. We believe you. If We thought that it was false, what would have held Us back from razing your churches and expelling you from the empire? False laws are those which, on the pretext of teaching virtue, fan the spirit of revolt, as is the case with the White Lotus Teaching. What would you say if We were to dispatch a group of bonzes and lamas to your country to preach their doctrines? How would they be received? Li Madou 利瑪竇 [Matteo Ricci] came to China in the First Year of the Wanli reign. We will not discuss what the Chinese at that time did; We are not responsible for that. Then you were but few in number, and it hardly mattered. You did not have your people and churches in all provinces. It was only under the reign of my father that you began to build churches everywhere and that your doctrines started to spread rapidly. We observed this, but we dared say nothing. You may have known how to deceive Our Father, but don’t think you can deceive Us in the same way. You wish to make the Chinese all Christians, and this is what your law demands. We know this very well. But in this case what would become of Us? Should We not soon become merely the subjects of your kings? The converts you have made already recognize nobody but you, and in a time of trouble, they would listen to no other voice than yours. We know that at present We have nothing to fear, but when foreign ships start coming in their thousands and tens of thousands, then it may be that serious disorders will arise. What We do now, We do in Our role as emperor. Our only concern is to rule the empire well and, to that end, We apply ourselves from dawn to dusk. We do not even see Our children or the empress, but only those who are charged with public administration. This state of affairs will continue throughout the three-year period of mourning [for Kangxi]. After this, We will, perhaps, be able to see you more often. 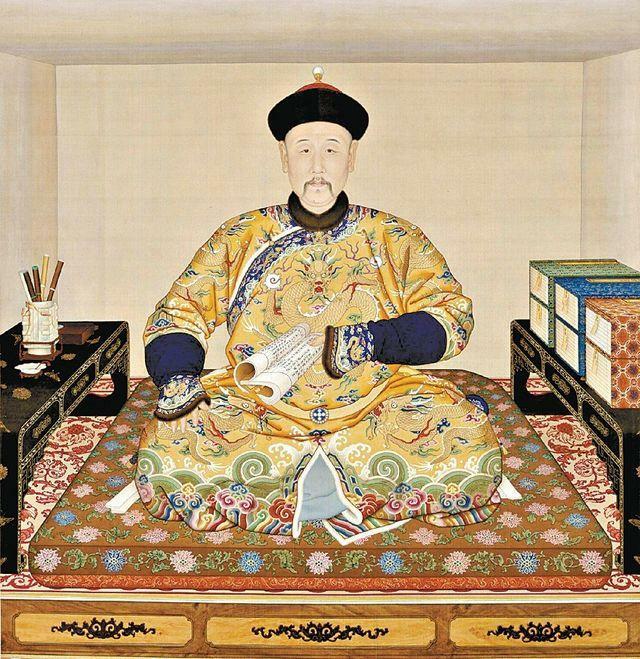 Here Yongzheng depicted himself as a just ruler absorbed by the heavy duties of governance; a ruler preoccupied with the security of the empire, rather than with enforced ideological conformity. This audience indicated to the missionaries, and indirectly through them the European public, that the emperor and his governors were concerned about the sea borders of the empire and the continued foreign presence in Macao and other ports. They feared that the missionaries and their converts could form a potential ‘foreign fifth column’ and the issue was not their religion as such, at least in Yongzheng’s personal view: ‘You say that your law is not a false law. I believe you’; and again, ‘In conclusion, do not think that We hold anything against you or that We wish to suppress you. […] What We do now, We do in Our role as emperor.’ The 1724 audience offered a rare moment of imperial candor: for the first time, missionaries heard, face-to-face, a clearly articulated imperial opinion on the political threat of Christianity. The emperor’s statement was also a true feat in political manoeuvering; in it he represented himself as a ruler bound by duty and the moral obligation to prohibit Christianity while remaining, inherently, benevolent in his treatment of these ‘men from afar’. Among the sects to be prohibited they proposed to me the religion of the Muhammedans, so that We would proscribe it. But We replied that the accusers do not consider in fact that the Muhammedans never provoke any disturbance, they propagandise their sect only among their own descendants, and do not oblige anybody to follow it, they accommodate themselves to the customs of the empire, do not offer any cause for accusations, and do not impede the cult and the doctrine of Confucius. We know very little about what was done by us under Our Father the Emperor [regarding you Christians. But] We recall having already said as much when We saw you most recently [on 1 July]. Your law is not a peaceful one: the literati agitate against it, because you attack their doctrine. Since We now rule the empire, We are beholden to be mindful of their laws, as much as required by reason. We perceive nevertheless that they have reasons to complain about you. As for Ourselves, who are Manchu, according to you We should abandon the cult of the ancestors, something We do not want to do at all. Actually, if We all were to embrace the European religion as you desire, what has happened to the Muscovites would be imposed on us: they were even forced to shave off their beards. You do not absolutely wish to be regarded as Buddhist monks. However, the empire cannot be controlled by Buddhist monks and lamas, and thus your issue is no less difficult. It is appropriate to proceed slowly, gently and cautiously. This statement advanced a theological point about the unity of the divine and of religions, while also stating the absolute supremacy of the state over any organisation. It was yet another example of Yongzheng’s attitude towards religions, and it became a more prominent feature of his thinking in the following years. That the imperial opinion voiced in 1724 remained consistent over time is corroborated by the records of two audiences granted to the Christian missionaries in 1725. The emperor said that he had not called us earlier because he was in mourning, nor had he summoned any bonzes. From now on we would be allowed to visit him from time to time … . He also said that our Christian religion is good, and when there are evil men like Mu Jingyuan 穆敬遠 [that is, João Mourão, see below], they should not be considered Christians, like some lamas who were not true lamas. And here he mixed up all other sects, saying that all spurred people to do good. Clearly, Yongzheng was indifferent to Christianity as a religion for he actually believed that it was not that dissimilar from Buddhism or ‘all other sects’. He was a proponent of the unity of the Three Teachings and to him all legitimate teachings shared the goal of spurring the people to be good. You Europeans reside in Beijing and Canton. You proselytize in these two places, and We do not forbid you from doing so. We will also let you go to other places, but why would you want to be in all of China’s provinces? … Two or three here cannot even talk our language, what do they want to do in the provinces? … . If your teachings remain in Beijing and Canton, they will last forever, but not so in the provinces, where Chinese officials are going to accuse you … . You are not expelled, nor have We given an order to destroy your churches, nor have We forbidden your religion. As for Westerners who reside in China, We shall apply to them the principle that the Emperor should love All Things As One. In other words, We shall always direct them to be prudent and quiescent. If they really observe Our laws with due care and maintain order and act without transgression, We shall extend to them Our love and clemency. 至於西洋寓居中國之人。朕以萬物一體為懷。時時教以謹飭安靜。果能慎守法度、行止無愆。朕自推愛撫恤. This was Yongzheng’s formulation, for Christians and Muslims alike: be prudent and obedient, and respect the laws. Given the continued activities of underground Christian communities, and the presence of incognito missionaries in the provinces, it was only a matter of time before there was trouble. In response to the 1724 prohibition of Christianity, the Portuguese Crown — the principal patron of Catholic missions in China — planned an embassy to mollify the new emperor. In December 1726, news reached the Beijing court that an ambassador from Portugal, Alexandre Metello Souza e Menezes (1687-1766), was already in Macao and requested permission to proceed to the capital. The enterprise had been organised in Lisbon at the urging of Macao, which feared that the prohibition of Christianity in the provinces and the expulsion of the missionaries would bring to an end the Portuguese presence in China. The fact that the Jesuit João Mourão, the Portuguese subject and a semi-official agent of the Crown mentioned above, had been imprisoned, also preoccupied the Portuguese ruler, King João V. Unbeknownst to the Portuguese, in fact, by the time the embassy reached China, Mourão had already been executed on an imperial order in Xining 西寧 (Qinghai) on 24 August 1726 on the grounds that he had conspired with Yongzheng’s siblings against the emperor. The arrival of the embassy, which consisted of an imposing delegation of more than one hundred people, offered Yongzheng an opportunity to make known his position on Catholicism to the world. In a famous edict issued on the day of the arrival of Metello in Beijing, 28 May 1727, which coincided with the Buddha’s Birthday, the emperor issued ‘Our Opinion’ 朕意. In it he defined Catholicism as being ‘heterodox’ 異端, albeit with some qualifications. This was to be his final public imperial pronouncement on the topic, and as such it was published in the Capital Gazette (京報 or 邸報) and distributed to the entire bureaucracy. Today is the Buddha’s Birthday; coincidentally the ambassador from Portugal [that is, Xiyangguo 西洋國] has presented Us with a memorial of congratulation. These two events have occurred simultaneously. For this reason, We embrace the opportunity, now that the ministers in the Court have finished the public business of the day, to proclaim to you Our Opinion 朕意. Hitherto, the Buddhists and the Daoists have strenuously attacked the religion of the Westerners. In turn, the Westerners have severely decried the errors of the Buddhists and the Daoists. They calumniate each other and denounce each other’s beliefs as heresies 異端. They regard their own doctrine as the sole orthodoxy 正道 and all other teachings as heresies. 今日為佛誕之期恰遇西洋國使臣上表稱賀兩事適然相值故於在廷諸臣奏事之暇偶將朕意宣諭爾等知之向來僧道家極口詆毁西洋教而西洋人又極詆佛老之非彼此互相訕謗指為異端此等識見，皆以同乎己者為正道，而以異乎己者為異端. [Their heresy, however,] is not what our sages called ‘heresy’. Confucius said, ‘The study of strange doctrines 異端 is harmful indeed!’ [Lunyu 論語, 2.16]. Does Confucius regard the opinions of people other than himself as a ‘heresy’?! [He certainly does not.] In employing both Chinese and foreign teachings, we do not consider which are orthodox, but rather whether they harm the manners and morals of the time. Those are all regarded as heterodox. 非聖人之所謂異端也。孔子曰：攻乎異端，斯害也已。孔子豈以異乎己者概斥之為異端乎。凡中國、外國所設之教，用之不以其正，而為世道人心之害者，皆異端也. China has her Chinese teachings, just as the West has Western teachings. Western teachings do not need to be practiced in China; similarly, how can Western countries practice Chinese teachings? 中國有中國之教，西洋有西洋之教，彼西洋之教不必行于中國，亦如中國之教豈能行于西洋. If they say that Heaven, for the sake of saving the people, transformed itself into a human being on this earth, they wantonly lie. They use the name of Heaven to seduce and enchant our foolish people into following their religion. This is the heresy of the West! 若云天轉世化人身以救度世人, 似此荒誕之詞，乃借天之名，蠱惑狂愚率從其教耳，此則西洋之異端也. This specific formulation of the imperial critique of ‘Western heterodoxy’ was slightly opaque, but Yongzheng’s point was not a theological one. The edict in its entirety was clearly underpinned by a relativistic view of religions and a practical political preoccupation for stability; the very nature of these concerns ignored the possibility that there could be more subtle theological or cosmological considerations. On that occasion, the emperor stopped short of issuing any further prohibition against Christianity in addition to those already issued, although he clearly called Catholicism ‘heterodox’. But the condemnation was not total, simply one that referred to the socio-political implications of Christian teachings in China. Your Law is not necessary here: you worship Heaven, and call him the Lord of Heaven, which means the same. Who does not worship Heaven? We even have a temple dedicated to Heaven. All teachings, including those of the Confucians, the Bonzes, the Lamas, the Muslims — they all worship Heaven. Buddha, the Jade Emperor, Heaven, the Lord of Heaven all are the same. All people worship Heaven. So what is the use for your teachings in China? You criticise the other sects. Perhaps because one is bad, the other is good? Quite the contrary: all sects are in the end the same, and all have something good, and yet within each of these teachings, from those of the literati and other ones to your Teachings of Heavenly Lord 天主教, very few fully understand their own doctrine. You first have to know your own heart [心, that is ‘heart-mind’], and then you will grasp your own doctrine. Don’t we [in China] have your Ten Commandments, too? All teachings say the same thing, which is to do good. Would the Lord of Heaven punish someone who does good, even if outside of Christianity? In his earlier public edict of 28 May that year, Yongzheng had already discussed the idea of the unity of all teachings (not only Buddhism, Daoism and Confucianism, but also ‘non-Chinese’ religions such as Tibetan Lamaism, Islam and Christianity), and he had argued that the worship of Heaven was a universal feature. Given his penchant for Chan Buddhism, Yongzheng favored the Confucian School of the Mind 心學. Indeed in the above passage we find a reference to the heart-mind. It was a way of teaching the missionaries a lesson, and a way of humiliating them for ignoring the true meaning of their own religion. This approach confused the missionaries. After the audience they commented among themselves that ‘he spoke with us with firmness, displaying a confusion of all teachings together, scorn for Christianity, us missionaries, and all other teachings and their followers, so arrogant and self-confident, considering himself Master of all teachings.’ What to the missionaries seemed intellectual and theological arrogance, was nothing but emblematic of Yongzheng’s evolving understanding of the role of religion in the Qing state, one that derived in part from his own spiritual practice of Chan tradition and in part from his daily experience ruling an empire. Emperor: What is the main foundation of your faith? Pedrini: To believe and worship the only Creator of Heaven and Earth. Pedrini: [Our God] is the only true god of the world as He created heaven and earth, He is the only one worthy of worship and all the others are false. Emperor: If that is the case, why do you honor Us? It would be sufficient to honour your god, and not bother with anything else. Pedrini: We honour Your Majesty because God so ordains, and we would offend God if we did not honour earthly rulers. Pedrini: Buddha and the other gods are enemies of the true God, and thus we cannot honour them without offending the true Lord. Emperor: What do you mean by enemies?! They are no enemies at all. […] Buddha is not an enemy of God. He has created heaven and earth, has neither beginning nor end, and is infinite. We are not talking of the mortal Buddha who had a father and mother, but of another invisible Buddha, principle of all things. This exchange shows Yongzheng eagerly promoting his ideas of the unity of teachings, using Buddhism and its cosmological concepts as the foundation of his argument. He also correlates the worship of God with the honour due to temporal rulers. This would suggest, as Huang Pei 黃培 long ago observed, that for the emperor religious teachings were a powerful part of political legitimation, as well as ideological devices in the service of state-building. According to the records, there were no significant imperial audiences between 1728 and 1733, although it was customary for the missionaries to offer greetings to the monarch several times a year in a ceremony they called cin an or zingan, that is, qing’an 請安 or ‘rito di salute’ (ritual to inquire after the imperial health). On such occasions the missionaries were occasionally admitted to the imperial presence where they exchanged some pleasantries with the ruler, and were regaled with food. On 30 September 1730 an earthquake destroyed parts of Beijing and killed many people. On 5 October, the emperor summoned missionary representatives to the Yuanming Yuan and showed support for them by bestowing relief funds for the rebuilding of damaged churches. There was, however, no discussion of religious matters. I am writing to inform you of an audience we had with the Emperor on March 18 . I pray God this will be the last one, since on that day the Emperor spoke to us in a tone quite different than in other audiences. This was not the last audience granted to the missionaries by the emperor before his death in the autumn of 1735, but it was the last occasion on which Yongzheng engaged in any meaningful conversation with them. As Pedrini mentioned, the tone was quite different. After the setback of the 1732 expulsion, the court missionaries sought this audience to plead that at least two or three priests be allowed to return to Canton to serve as procurators for the religious orders in that important international port. On 18 March 1733, the emperor received eleven missionaries in the presence of two ‘ministers of state’. Rather than addressing their request, Yongzheng berated them for failing to honor their parents and to pay obeisance to their deceased relatives. When the missionaries protested that this was not the case, Yongzheng ordered the ministers to gather Christian texts from the Beijing churches, study the matter, and report to him. The missionaries thought that the ruler was trying to find a pretext to have all of them banished. Yongzheng was probably still influenced by the accusations he had read in Ortai’s memorial. Minor officials conducted perfunctory inspections of the capital’s churches, and collected Christian catechisms for examination, but otherwise no further investigation was conducted. Missionary sources report on a few further audiences, but none seem to have been of particular significance. Six months later, in mid-September 1733, five missionaries were summoned to court for a customary greeting audience. After having communicated his good health the emperor dismissed them. He also briefly met them on 4 February 1734, on the occasions of the Lunar New Year, and he received the newly arrived Jesuits Gabriel Boussel and Pierre Foureau at the Yuanming Yuan on 19 September 1734. So far I have not be able to find reference to any other encounters prior to Yongzheng’s death on 8 October 1735. We know that secret memorials from Guangdong and Fujian in 1733-1734 warned of the connections between the Christians and the Philippines, and that these reports alarmed the emperor who was concerned about the security of the coast, foreign encroachment, and the presence of ‘traitors’ 漢奸 who travelled between Fujian and Luzon. His coldness towards the court missionaries in the last two years of his life was probably caused by these preoccupations (he was a very busy man as well), but he might have also purposely endorsed the status quo, continuing to reduce the room for movement of the church in the provinces, while allowing the priests in Beijing enough leeway to remain a conduit for introducing useful European know-how and technology to the Qing government. This is a revised excerpt from Eugenio Menegon, ‘Yongzheng’s Conundrum. The Emperor on Christianity, Religions, and Heterodoxy / Der Rätselhafte Yongzheng. Der Kaiser über Christentum, Religionen und Heterodoxie’, in Barbara Hoster, Dirk Kuhlmann, and Zbigniew Wesolowski, eds., Rooted in Hope / In Der Hoffnung Verwurzelt. Festschrift in Honor of Roman Malek S.V.D. on the Occasion of His 65th Birthday. Festschrift für Roman Malek S.V.D. zu Seinem 65. Geburtstag, Routledge / Monumenta Serica Institute, 2017, vol.I: 311-335. 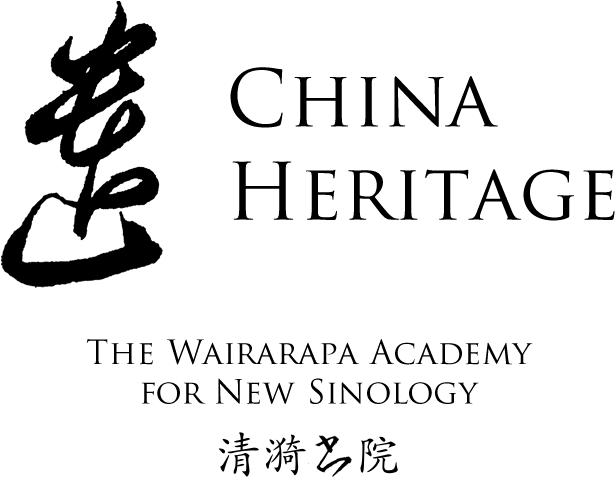 The author would like to thank the editor of China Heritage for inviting this contribution and for his extensive editorial suggestions. The original Chinese memorial of the missionaries, with the imperial vermilion rescript quoted here, is reproduced in Zhongguo diyi lishi dang’anguan 中國第一歷史檔案館, ed., Historical Materials on Catholicism in Early Qing China 清中前期西洋天主教在華活動檔案史料, Beijing: Zhonghua shuju, 2003, vol.1, doc.43, pp.58-59 (hereafter QTS); cf. also Zhongguo diyi lishi dang’anguan 中國第一歷史檔案館, ed., Yongzheng chao Hanwen zhupi zouzhe huibian ; see A Compilation of Memorials with Chinese-language Vermilion Rescripts from the Court of Yongzheng 雍正朝漢文硃批奏摺彙編, Nanjing: Jiangsu guji chubanshe, 1989, vol.3, doc.22, pp.26-27 (hereafter YZH); a copy can also be found in the Roman Archives of the Society of Jesus, Archivum Romanum Societatis Iesu (hereafter ARSI), Jap. Sin. 179, ff.303r–v, without rescript and with a relevant imperial edict instead; cf. Pasquale D’Elia, Il lontano confino e la tragica morte del P. João Mourão S.I., missionario in Cina (1681-1726) nella storia e nella leggenda, secondo documenti in gran parte inediti, Lisboa: Agencia-Geral do Ultramar, 1963, photograph 9. This imperial vermilion rescript is reproduced in QTS, vol.1, doc.43, p.59; and YZH, vol.3, doc.22, p.27. The emperor addressed this speech to the Jesuits Ignaz Kögler, Dominique Parennin and Joachim Bouvet. The three missionaries, coordinated by Parennin, made a transcript of the emperor’s words from memory immediately after the audience, and in accordance with the emperor’s order that his words be reported to their confreres. The French version can be found in M. Louis Aimé-Martin, ed., Lettres édifiantes et curieuses concernant l’Asie, l’Afrique et l’Amérique, avec quelques relations nouvelles des missions, et des notes géographiques et historiques, Paris: Paul Daffis Libraire-Éditeur, 1875-1877 (hereafter LEC), vol.3, pp.363-364; see also two manuscript copies of a Latin version in ARSI, Jap. Sin. 179, ff.385r-387r; and one manuscript French version, dated 8 July 1724, sent by Parennin with some additional contextual material to the Vice-Procurator of Propaganda Fide in Beijing, the Discalced Carmelite Rinaldo Romei, in Archivio Storico della Congregazione per l’Evangelizzazione dei Popoli o ‘de Propaganda Fide’, Scritture Originali della Congregazione Particolare dell’Indie Orientali e Cina (hereafter APF, SOCP), vol.31 (1723-1725), ff.175-177r. For an English translation of the published French version, which I follow here, see Jocelyn Marinescu, ‘Defending Christianity in China. The Jesuit Defense of Christianity in the Lettres édifiantes et curieuses and Ruijianlu in relation to the Yongzheng Proscription of 1724’, Ph.D. diss., Kansas State University, 2008, pp.295-299 (apparently based on Demetrius Charles Bolger, A Short History of China, London: Allen, 1893, p.156). Ricci arrived in China in 1582, not in 1573, the first year of the Wanli reign. This passage was famously and approvingly quoted as an example of Yongzheng’s enlightened rule by Voltaire in his Lettres chinoises, indiennes et tartares; see Les Oeuvres complètes de Voltaire, 1775-1776, vol.77B, ed. Nicholas Cronk, Oxford: Voltaire Foundation, 2014, p.158. See ‘Relatio eorum quae successère circa petitam & obtentam abeundi licentiam pro duobus missionarijs S. Congregationis de Propaganda in Urbem revocatis è Sina anno 1724’, ARSI, Fondo Gesuitico, 722.2, f.74v. Yongzheng’s tolerant attitude towards Islam is reflected in several edicts from the period 1724-1730; see Donald Leslie, Islam in Traditional China. A Short History to 1800, Canberra: Australian National University Press, 1986, pp.123-124. See ‘Relatio’, ARSI, Fondo Gesuitico, 722.2, f.74v. The mention of the Muscovites might be a reference to the order given by Peter the Great in 1698 to his boyars to shave their beards off, followed by a 1705 edict fining members of the elite who still sported beards. Here Yongzheng seems to attribute this policy to Catholicism, rather than to the czar’s modernizing agenda, inspired by his tour of Western Europe in the 1690s. Perhaps, he is simply using the example to show the impact of ideological change on society. Ibid. Here the sentence ‘the empire cannot be controlled by Buddhist monks and lamas’ is probably a reference to incidents in 1724-1725 in which several Buddhist monks pretended to be retainers of the emperor when he was a prince, and forged texts in an attempt to prove it and thereby gain influence. The emperor issued a decree to the Board of Rites, clarifying that his sympathy for Buddhism did not mean that monks were his political advisors. 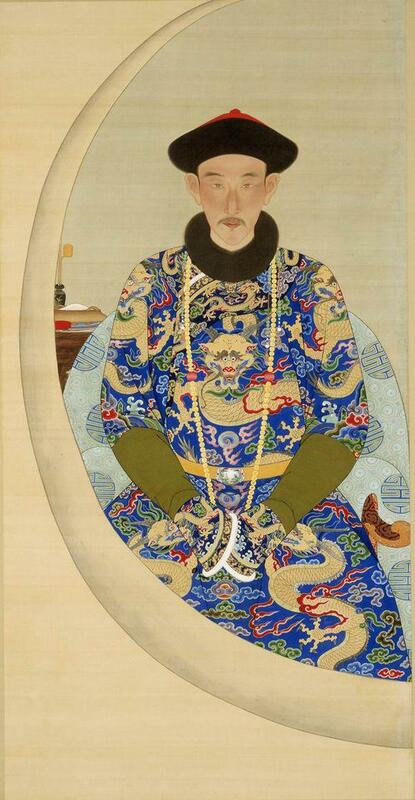 See Mark McNicholas, Forgery and Impersonation in Imperial China. Popular Deceptions and the High Qing State, Seattle: University of Washington Press, 2016, p.32. This was one of several audiences in 1725, mostly connected to the arrival of this small papal legation; only in two audiences there was any discussion of religious issues. The source here is a letter by Pedrini written in Beijing and dated 19 November 1725, in APF, SOCP, vol.32 (1726), ff.476r-v. For similar accounts, see a letter by Antonie Gaubil SJ dated 27 October 1725 in Antoine Gaubil, Correspondance de Pékin, 1722-1759, ed. Renée Simon, Geneve: Libraire Droz, 1970, p.92; and a manuscript by Rinaldo Romei OCD in the Archives of the Discalced Carmelites in Rome (ms.207d A and 207f B), ed. Paola Bracaglia, ‘Per una storia delle relazioni diplomatiche luso-asiatiche: l’ambasciata di due Carmelitani Scalzi all’Imperatore Sung-Chin [sic] 1724. Documentazione Inedita’, BA Thesis, Università degli Studi della Tuscia, Viterbo, 2003 (I would like to thank Professor Mariagrazia Russo for granting me access to this work). The sentence ‘lamas who were not true lamas’ is, again, likely a reference to criminal cases involving monks who forged their identity in 1724-1725, see McNicholas, Forgery and Impersonation in Imperial China, pp.30-32. Archivio Storico della Congregazione per l’Evangelizzazione dei Popoli o ‘de Propaganda Fide’, Scritture Originali della Congregazione Particolare dell’Indie Orientali e Cina (hereafter APF, SOCP), vol.32 (1726), f.477r. See Fortunato Margiotti, ‘De missionariorum proscriptione ex imperio sinico’, in Margiotti Fortunato, Gaspar Han and Antolín Abad Pérez, eds, Sinica Franciscana IX. Relationes et epistolas fratrum minorum Hispanorum in Sinis qui a. 1697-1698 missionem ingressi sunt, Madrid: apud Centrum Cardenal Cisneros, 1995, pp.lxi-cxvii; Tang Kaijian 湯開建, ‘Research on the Forced Relocation of Missionaries to Guangzhou during the Yongzheng Period’ 雍正教難期間驅逐傳教士至廣州事件始末考 , Qing Historical Researches 清史研究 (2014/2): 1-33. Veritable Records of Shizong, the Xian Emperor [Yongzheng] of the Great Qing 大清世宗憲皇帝實錄, juan 37, pp. 6b-7b, as translated in Fu Lo-shu, A Documentary Chronicle of Sino-Western Relations, Tucson: AAS-University of Arizona Press, 1966, vol.1, p.144. On this embassy, see Mariagrazia Russo — António de Vasconcelos de Saldanha, Embaixada de D. João V de Portugal ao Imperador Yongzheng da China, 1725–1728, Lisboa: Fundação Oriente, 2005; and Mariagrazia Russo, A Embaixada enviada por D. João V ao Imperador Yongzheng (1725–1728) através da documentação do Arquivo Distrital de Braga, Lisboa: Centro Científico e Cultural de Macau, I.P. Ministério da Ciência, Tecnologia e Ensino Superior, 2007. Parennin summarizes this document within a description of the vicissitudes of the Sunu clan: ‘un écrit adressé à tous les grands de l’empire et que la gazette a publié … à l’occasion de la première audience qu’il donna à l’ambassadeur de Portugal.’ His judgement of Yongzheng’s words is scathing: ‘Il est assez plaisant, dit-il, que le jour même de la naissance de Foë, j’aie vu aux pieds de mon trône un ambassadeur d’Europe. Il se met ensuite à dogmatiser; et, s’érigeant en juge souverain de toutes les religions il se moque de la secte de Foë, et prétend réfuter certains points du christianisme.’ See LEC, vol.3, p.436. Edicts of Shizong, Emperor Xian, to the Cabinet 世宗憲皇帝上諭內閣 (hereafter Shangyu neige), juan 56, p.17b, in Qinding Siku quanshu 欽定四庫全書, as translated in Fu Lo-shu, A Documentary, vol.1, pp.155-157, with my revisions; a complete English version by Thomas Watters can be found in his ‘Discourse on Heresy by a Chinese Emperor’, The Chinese Recorder and Missionary Journal, 4 (1872) 9, pp.225-227; cf. Marinescu, Defending Christianity, p. 230, for an analysis of this passage. Shangyu neige, juan 56, 17b. Shangyu neige, juan 56, 19b. Shangyu neige, juan 56, 18a. ‘Discorso fatto dall’Imperatore a dieci europei, otto P[adri] della Compagnia e due Carmelitani Scalzi, li ventuno di luglio del 1727 in occasione che andarono a ringraziare S.M. de’ benefici conferiti al Legato di Portugallo ed insieme a chiedere della salute della M[aestà] S[ua]’, APF, SOCP, vol.33 (1727-1728), f.420r. Besides the usual courtesy visits and gift exchanges at court, mentioned in several sources, around June 10–15, 1728 (‘no principio da … 5 luna’), the emperor called the missionaries José Soares, Parennin, Pedrini and Giovanni Giuseppe Costa, and interrogated them on the medicinal properties and the market for opium. This was in response to a memorial from an official in the Ministry of Personnel, a native of Fujian, reporting on the diffusion of ‘yapien from Holland’ in that province and seeking an imperial prohibition; see ARSI, Jap. Sin. 128, f.165r. APF, SOCP, vol. 34 (1729-1730), ff. 218r-221v, Teodorico Pedrini, ‘Breve relazione d’una udienza data dall’Imperatore a quattro missionarij di Pekino’; this transcript was collated with the version in Archivum Generale Ordinis Fratrum Minorum, Fondo Hankow, MH-14-2-65, Roma, kindly provided by Gabriele Tarsetti and Fabio Galeffi (Centro ‘Teodorico Pedrini’, Fermo, Italy), and recently published in Teodorico Pedrini, ‘Son mandato à Cina, à Cina vado – Lettere dalla Missione 1702 – 1744’ [‘I am dispatched to China, so I am going to China’ – Letters from the Mission, 1702-1744], edited by Fabio G. Galeffi & Gabriele Tarsetti, Macerata: Quodlibet, 2018; a French translation of the ACMR copy — ‘Courte relation d’une audience accordée par l’Empereur de la Chine à quatre Missionaires de Pékin’ — was published in Mémoires de la Congrégation de la mission, Paris: à la Maison principale de la Congrégation de la Mission, 1866, vol.7, pp.340-350. The Jesuit André Pereira compiled a Portuguese version of the conversation based on his recollections, which contains some different language. See ARSI, Jap. Sin. 128, ff. 165r-166v. There is no space here for a detailed comparison of the two versions. See Huang, Autocracy at Work, pp.46-50. Gaubil confirms that there had been no meetings for some time, as Yongzheng is here quoted saying: ‘It has been a long time since I saw any of you Europeans, I was worried about you all, and I am relieved to know that you are all safe.’ See Gaubil, Correspondance, p.267. The original memorial in QTS, doc. 52, pp. 68-71; see also Yang Wenxin 楊文信 (Yeung Man Shun), ‘The Development and Frustrations of Catholic Missionary Activities in Guangdong in the Reign of Yongzheng: focussing on the forced relocation of missionaries from Guangzhou to Macao in 1732’ 雍正年間天主教傳教士事業在嶺南的發展與挫折: 以1732年去除廣州傳教士往澳門之時間為中心, in Zhao Chunchen 趙春晨, He Dajin 何大進, Leng Dong 冷東, eds, East and West Cultural Exchanges and Social Transformation in South China 中西文化交流與嶺南社會變遷, Beijing: Zhongguo shehui kexue chubanshe, 2004, pp.657-677. Pedrini to the Prefect of Propaganda, April 20, 1733, APF, SOCP, vol. 37 (1735), f. 309r; cf. also ibid., 21 October 1733, ff.311r-313r; a French translation of a copy of Pedrini’s account in the Archives of the Missions Étrangères de Paris — ‘Courte relation des paroles dites par l’Empereur le 18 mars 1733’ — was published in Mémoires de la Congrégation de la mission, Paris: à la Maison principale de la Congrégation de la Mission, 1866, vol.7, pp.353-358. See also several Jesuit reports in Latin and Portuguese of the same audience in Gaubil, Correspondance, pp.351-353 (from the Biblioteca Nazionale Centrale, Rome), and in ARSI, Jap. Sin. 128, ff.191r-v, 192r-193r, 194r-195, 204r-205r, 206r-v, 215r-219r. The Propaganda and Jesuit missionaries bickered about the contents of the conversation so much that Pedrini wrote to the Propaganda Procurator Arcangelo Miralta in Macao: ‘Here we argued about the audience and reports pertaining it for two months, so much so that I had to write a whole book of papers related to it.’ See APF, SOCP, vol.36 (1732-1734), f.580v. On these issues, see memorials from the Guangdong and Fujian provincial officials in the 1730s, published in YZH, vol.26.